Want to turn your creative thinking about objects into a reality? Of course you do. What if you could just magic up a new button for the one that fell off your favourite shirt? What if you could invent a new way for carrying hot items in the kitchen? What if? The rise of 3D printing holds a lot of promise for those of us who can focus and visualise what we might make. The idea of the replicator might have sparked the imaginations of Star Trek viewers or the Maker with ‘base block’ (recycled or otherwise) from Warren Ellis’ Transmetropolitan series could point to a home unit that can take spoken commands to create almost anything. But we’re a long way from this future, for now. 3D printing might not be available in all homes yet, but the latest desk-top 3D printers being us one step closer to the possibility of manufacturing more things for ourselves. The process is not an easy one still, but some are more optimistic than others when it comes to future possibilities. Chris Anderson, former editor of Wired magazine recently left his editorial position to take up the position as CEO at 3D Robotics. Though the $5million+ investment in the company led by Jon Callaghan of True Ventures and Bryce Roberts at O’Reilly AlphaTech Ventures probably helped a lot, it’s Anderson’s belief in people’s own power to manufacture things for themselves that appears to have spurred on his change in career. Anderson’s book, “Makers” also came out recently. It outlines ways in which people are making products for themselves already and 3D printing plays a big part in the inspiration for more people to get involved. It’s smart to get in while the industry is on the uptick, but 3D printing has been around for some time and there’s a long way to go before domestic users will be able to think of something and print it off. It probably won’t come as a surprise to read that the term ‘3D printing’ was coined at MIT. In 1995, grad students Tim Anderson and Jim Bredt hacked an inkjet printer to spew a binding solution onto powder to create 3D shapes. After a time, the experiments became a business and Bredt and Anderson founded Z Corporation which was acquired by 3D Systems in January this year. That’s a lot of history to skip in one go, but the companies helping people print in three dimensions today are pushing the boundaries for heavy industry and small businesses to design and create some pretty amazing things. Shapeways is a 3D printing startup that began as a spin off of Royal Philips Electronics in the Netherlands. It was established in 2007 by Peter Weijmarshausen, Robert Schouwenburg and Marleen Vogelaa who pushed things further through the Philips Lifestyle incubator. In 2008 the company launched a service for customers to design their own 3D products by sending a computer aided design (CAD) file to the Shapeways website. Through this process, the startup has encouraged hundreds of designers and businesses to make things and sell them, as well as providing tutorials and generally working to democratize the manufacturing process. Shapeways has since printed and sold more than a million user-created objects from the delightfully silly to the practical and extraordinarily beautiful. Everything from Minecraft figurines and the Internet’s own “F U Anteater” to an assortment of wedding rings and even mathematical shapes have been explored through the service. Shapeways has recently opened up a new facility in New York’s Long Island City. Previously manufacturing happened in Eindhoven and the enormous spaces house the massive, multi-million dollar machines that create the products of customer’s minds. Touring a manufacturing site would have inspired relatively few people not so long ago. So it seems that the personal relationship that users and interested parties have with the 3D printing process is changing how we interact with industrial environments. So how hard is it to work out ways to submit a design to Shapeways? It seems that learning to use CAD software is not quite for everyone yet. The software itself can be expensive and it takes a lot of time invested to use the tools required to make the things you might visualize in your head. When it comes to bringing the process closer to users, the desktop 3D printer is strarting to inspire hobbyist and pro-consumers. Makerbot is practically a by-word for desktop 3D printer now. The company took 16% of all 3D printers, industrial and personal, from 2009 until 2011. The Brooklyn-based company was founded in 2009 by Bre Pettis, Adam Mayer, and Zach “Hoeken” Smith, with the aim of bringing 3D printing into the home and making it more affordable. The MakerBot Replicator 2 desktop 3D printer is the fourth-generation machine. It’s faster and has set new standards for the company when it comes to build volume, resolution, affordability and ease of use. The machine by itself will set you back $2,199, but when you think about the things you can make, and the possibilities for being creative, you could easily recoup that costs with the right ideas. Interestingly Makerbot has brought its wares closer to the domestic market by opening its flagship store in the NoHo district of Manhattan. In the shop, customers can see demonstrations, learn more about 3D printing and buy products made by other people. Getting into gear to make things is a bit easier too, as Makerbot’s ‘Thingiverse‘ – a catalog of projects offers more than 28,000 models and things to download for free use. Hot on the heels of the Makerbot success story, is Form Labs, makers of the Form 1 desktop 3D printer. The company was established by more MIT alumni. Maxim Lobovsky, David Cranor, and Natan Linder met as graduate students at the MIT Media Lab in 2009 as classmates in MIT’s legendary How To Make (almost) Anything class. They officially founded Formlabs in September 2011. Seed investors include Mitch Kapor, Joi Ito, and Eric Schmidt’s Innovation Endeavors. Maxim Lobovsky has been working in the field of 3D printing for some time including open source DIY 3D printers like the Fab at Home project. He says that he is spurred on by the future possibilities. “There’s a lot of unrealised potential here. You can do a lot of cool stuff with these machines as a hobbyist, in product development, for architects. The industry has been around for 25 years already so it’s been happening, but a lot more of that could be possible if these tools can get to a much wider range of people, if it’s more affordable. I think we’ve still only scratched the surface of what’s possible when it comes to demand,” he says. Form Labs leapt into the limelight online with the phenomenal success of its Kickstarter campaign. The company set out with a $100,000 goal and received $2,945,885 by the time the campaign closed. So how close to the home printing system are we? Lobovsky is hopeful for future developments but he is pragmatic about the current state of play. “We call our product the first prosumer 3D printer, I definitely don’t think this is a consumer product,” he says. “I don’t think 3D printing is quite there yet. The machines are still too expensive, they don’t do enough and they’re not quite easy enough to use for consumers. But to me it’s a continuum between the most advanced high end users and aerospace companies, things like that and the consumer. “It’s still a professional product but its affordable and easy enough to use that hobbyist, small businesses and people who have some need for a tool like this to prototyping or building products, this is now accessible to those people,” he explains. The future of 3D printing for Lobovsky looks like a lifelong career. the multifaceted nature of the business is something that spurs him on. ” For me it’s really exciting because it pulls from so many disciplines. Technically its software, mechanical engineering, electrical engineering and materials all combining into the product. For the business we’re selling the machine, materials and tools. It’s a really interesting and fun system we’re building. Pushing the idea of 3D printing to a wider audience is not hard when it comes to inspiration, but while there are still some fairly high barriers to entry for domestic users, it can still be hard work making sure the message gets past hobbyists and the technically inclined. 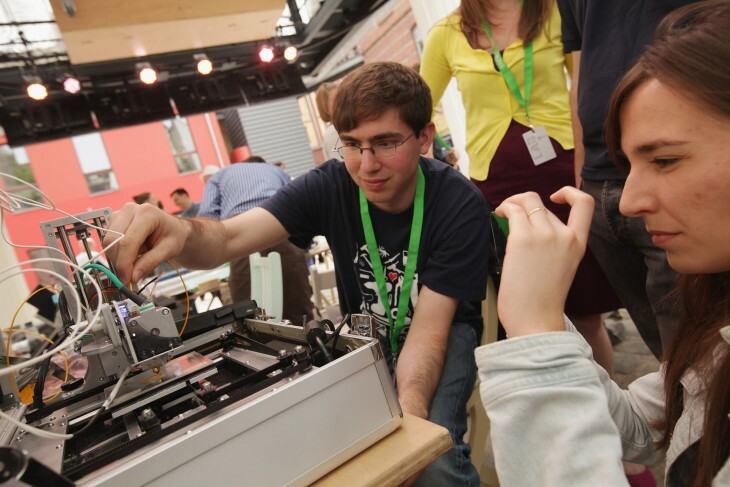 RepRap Central was founded in 2010 by Peter Ormond to address this. His excitement about 3D printing borders of the evangelical, but it is also quite infectious. Although others have pointed out that this is currently a niche market, Ormond is focused on the future, “The universality of 3D Printers will ensure it’s anything other than niche,” he says. The prospect of home printing is not a future prospect for Ormond either. “It is taking off right now and we intend to make it as exciting as we possibly can,” he enthuses. “Many of our home users have their 3D printer next to their inkjet and PC, ready to print their next invention, create a piece of innovative jewelry or print that elusive curtain ring. The opportunity to create a business using your personal 3D printer is there, you just need to make it happen”. That said he is tempered somewhat by the challenge of making software more accessible. “The original software used to create 3D models had a learning curve which won’t have suited everybody,” he says. “Fortunately, a great deal of effort has been put into making 3D modelling fun and with products such as Google Sketchup and Tinkercad, 3D modelling has never been easier. Naturally Ormond has a number of 3D printers of his own and puts them to practical use. “I am currently creating a replacement drawer for our Washing machine, sorry it’s not a Nasa Satellite object but it is an object that needs replacing. I’ve recently printed an ornate Celtic inscribed Skull and a Canon DSLR Camera Model.” You can see Ormond’s examples and other work on the RepRap Central blog. It’s encouraging the hear the excitement Ormond embodies when it comes to 3D printing. “I’m inspired by all those who create things, large and small,” he says. “We are just seeing a glimpse of what these 3D Printers are capable of. There are some that are capable of printing organic structures, human tissue and early organ prototypes. We will shortly be able to print buildings, Cars and even the electronics and Optics to go into Cameras and such like. The future today sounds exceptionally cool. At TNW we’re skeptical about the domestic uses for now. As a business prospect though, it’s hot property to be jumping into and the market is already starting to fill up. The idea of being able to recycle and remake things though, that’s a very appealing idea. Although as seen in the Transmetropolitan comic books, maybe in the future only the rich will make things out of newly minted maker materials. But if we can reuse things instead of piling them up in landfills and if I can finally match that missing button to the ones on my favourite shirt, then the future looks as though it will be worth waiting for. Just don’t take too long about it.